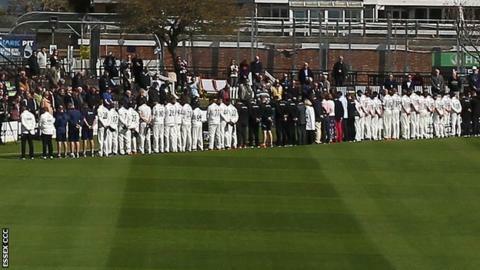 Sussex paid tribute to their former fast bowler Matthew Hobden before their opening home County Championship game of the season against Essex at Hove. The 22-year-old was found dead at a private property on 2 January after celebrating New Year with friends. A tree was planted in memory of the player at the Hove ground, while team-mates wore shirts with the number 19 and Hobden on the back in his honour. Sussex had already made the decision to retire the number 19 shirt. The cause of Hobden's death remains unexplained but there were no suspicious circumstances, according to police. After a willow tree was planted on the grassed area at the Sea End at Hove, a short ceremony took place, followed by a minute's silence. Family and friends took part in a service of thanksgiving to celebrate Hobden's life in February, following a private family funeral. Hobden's brother George told BBC Sussex: "We've had such lovely support from not only all our family and friends, but the club here at Sussex. It's just been overwhelming how much support we've had and how much Matthew was loved. "We always knew the support was there for Matthew. It's helped us immensely. "We spent our whole childhoods playing cricket together and that's why today is an emotional day. It was always a dream for one of us to play for the club - we basically spent our whole childhood in the garden playing cricket together. "I remember being down here as a 12-year-old kid and imagining if one of us did play here. Matthew did manage to do it. We were hoping that he was going to progress and play for England. "It was a dream for Matthew to play here. It's just a shame it's been cut short so tragically."